Jan at Bessie Mary has gotten a new (to her) fabric called Skip Dent. Kind of a funny name for a fabric. It is a poly/cotton blend by Scpechler-Vogel. It is a fairly inexpensive fabric which sometimes is just the ticket when a budget is tight or you want to make a quick gift that looks expensive but isn't. I really really like this fabric. Even though it is a poly blend it feels like a cotton when working with it. Except for one thing, no wrinkles. Now we all know I love an iron. I love the look of something that has been ironed even better. And I love the tone on tone look of it. So I set out to make another daygown with it. As always, click on the pictures to enlarge them. 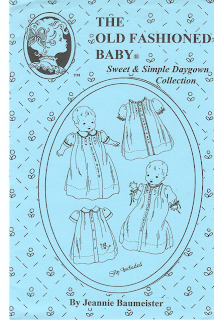 I used Sweet and Simple Daygowns from The Old Fashioned Baby. I am in LOVE with this pattern. When deciding on a color, I went with blue because blue can be gender neutral. I loved my little girls in blue and of course it is the universal "boy" color as well. Since the fabric arrived though, the need for gender neutral is out the window. The baby that will wear this little gown is a girl. And mommy wants the girly factor ramped up without being too frou-frou. So I was then on the quest to pink it up. And that is what I did. Not overly so I don't think. I hope you agree. This is the gown still damp. I washed it and then threw it in the dryer for just a few minutes to get out what my girlfriend used to call "hard wrinkles." So even before it is dry all the way and an iron has even touched it, it is essentially wrinkle free. 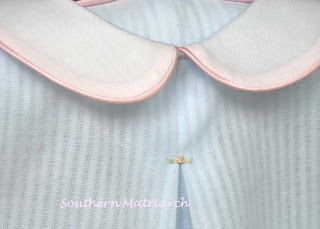 Pink satin binding on the white voile collar, some Swiss eyelet trim on either side of the placket, a teeny bit of embroidery and pink buttons. Tailored but girly and sweet. 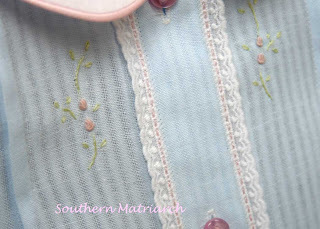 For an added touch of pink, I ran two strands of floss through the entredeux of the eyelet trim.If you click on it you will see I even missed a spot or two on the entredeux. But overall adds just another hint of color. I was going to embroider between the buttons as well, but decided with the pink buttons it didn't need it. A teeny rosebud on the top of the back pleat. Not needed, just a little "ahhh." 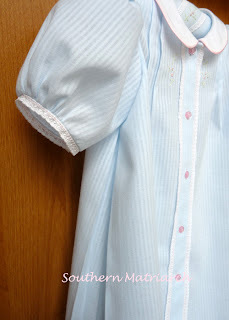 Another thing I like about this pattern is the underarm pleat. Controls the fullness without being overpowering. I did put in the hem by hand, again using two strands of the pink floss. All in all, I LOVE this fabric and I LOVE this pattern. 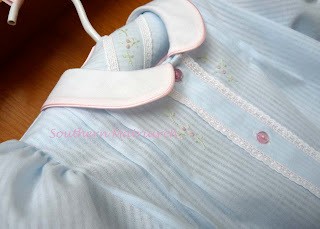 Some lucky baby will look so sweet in this little daygown. You do such good work. It's perfection. Truly. I like understated - not so much lace, and the embroidery just sweetens it up. I know you were daydreaming about rocking her to sleep in it the whole time you were making it! 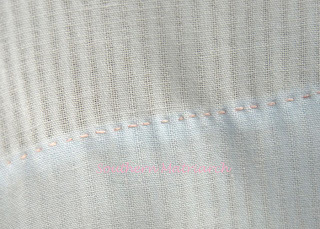 I like hemming with a running stitch. Quicker and prettier. what a precious gown!!! I love that fabric and have been wanting to use it. I always love to see your little bits of 'ahhhh" and this one is just precious!!!! So, so sweet! I love the blue with a touch of pink! It's so beautiful! I love your blog, you make the most beautiful things! Your gown is beautiful! 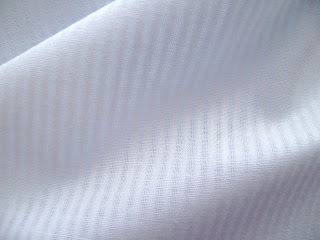 I just put an order for the skip dent at farmhouse fabrics...I can't wait to get it, now. What a delight! What do you use as a base to make your matching hanger? It is the extra sprinkles on this precious dish! Darling - just darling! I love it and I really love that pattern. 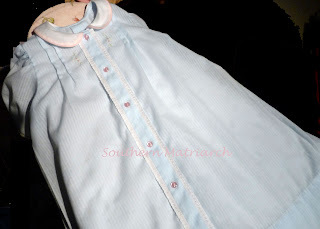 This is a beautiful little gown, and I love the fabric, but the touches of pink just make it so girly and sweet. WEll,I feel like the happy Great Granny here!! 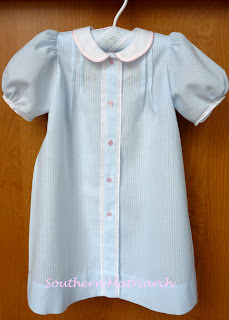 I love the beautiful Daygown you made using my pattern! Blue and Pink have long been a favorite old fashioned color combination of mine. The only way your Daygown could be improved is to put a baby in it! And I LOVE how you put the pattern and fabric together. Will you be my grandbabies' granny? Another pretty Martha-style. I love it, this grand is going to definitely be the best dressed baby girl. Sweet and simple and beautiful. But, simple for you is a year's worth of work for me! But thanks for sharing such lovely work and keeping me inspired! Love the fabric as much as the gown! Beautiful work! Such lovely work! You certainly captured the girly but not frou-frou look! Thank you for visiting me, and leaving the kind comment. Your daygown is to die for!!! 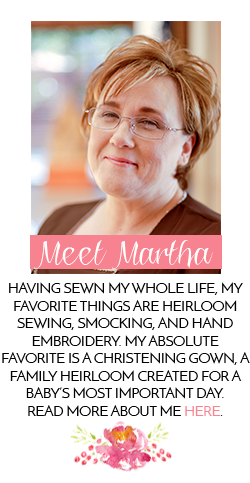 Another winner, dear Martha !! It is just as gorgeous as I knew it would be! Can't wait to see a sweet little cherub wearing it! Thank you so much everyone for your wonderful and kind comments. It was fun to make and I look forward to using the fabric and pattern again. I am such a total newbie. But I have acquired the same fabric (in white)as well as that pattern and next week am going to make my first stab at this kind of sewing. Thank you for the wonderful inspiration! All of your work is perfectly beautiful. I don't think I would have ever attempted this project without reading your blog so please know that you have inspired a new daygown sewer.